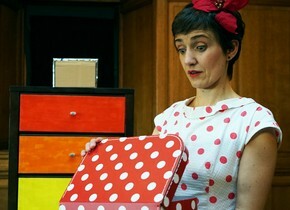 Ipdip theatre · Theatre for babies and toddlers. After our successful Awards for All supported tour of Head in the Clouds in 2017, we're delighted to be able to bring our work out again to groups of families who wouldn't otherwise get to come. And this time it's Calvinball! So we're warming up a fresh cast, dusting down the orange whatnots and getting fine weather sorted for the middle of June. 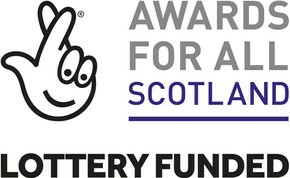 This has been made possible with support from The Robertson Trust, The Maple Trust, The Souter Trust and Foundation Scotland so thank you all - we can't wait! We're delighted to be taking our little elves to meet some new people in Tarland and Forglen on the 14th and 15th December. Perhaps a little early for snow so a good chance we might find some of the local elves hiding in the Aberdeenshire countryside. 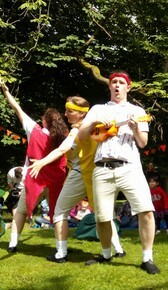 Thank you to North East Arts Touring (NEAT) for inviting us up! And here's that trailer for the show again. 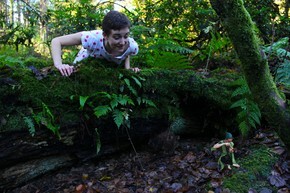 We've been loving meeting new elfologists at the Edinburgh Botanics as part of the Fringe festival. Tickets here!. And evidence of elves is being shared using #elfology on instagram, twitter and facebook. 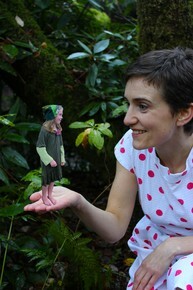 And here is a link to our trailer where you can meet elfologist Faye Greenwood. 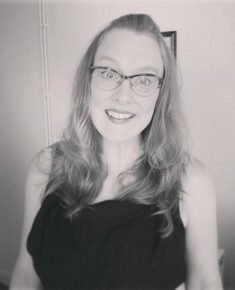 Dr Faye Greenwood is very excited to be taking her elf friends to meet new people in Clwyd and Edinburgh this summer. They've been hiding in all kinds of curious little places but with luck they'll be ready to come out and say 'hi' by the end of July. Tickets are on sale for the fringe dates here and for our one day in Mold here. And here she is herself to tell you more! Just like busy, shy little elves we've been working away on a new show. And now its ready to come out! Faye Greenwood will be sharing her knowledge and research into the lives of elves at The Bungo in Glasgow on 2nd and 3rd December and at Carnegie Hall Dunfermline on 7th, 8th and 9th. Look carefully, and you might also get to see some of her elfin friends. Happy spotting! 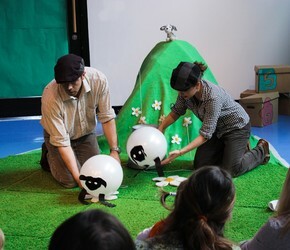 What a lovely summer we've had with Ipdip; Head in the Clouds touring in Wales and Calvinball a great success at the Botanics in Edinburgh as part of the Fringe. A major behind-the-scenes player in all of this was our producer the Wee Maverick herself, Janis Marshall-Reilly, so here she is in classy black and white. We'll be taking a little time now to write reports, some fresh applications and work on new ideas, that might include elves... watch this space. Our sheep are getting very excited about their tour in Wales in July; hoping to meet some friendly new faces - maybe even some sheep? 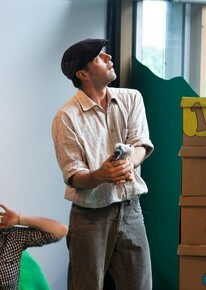 There are dates here, more about Head in the Clouds here, or click on this one for a wee trailer for the show. Had to keep the big news under wraps for a while but now we can shout it from the rooftops! This spring we have received funding from Awards for All to support two weeks of free performances of Head in the Clouds. 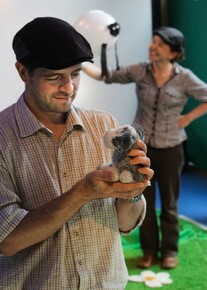 These shows will run alongside our Puppet Animation Festival tour and take place as visits to groups of young families who wouldn't otherwise be accessing live performance. It's an ambition Ipdip has had from the very beginning so we're super-excited to be realising it! 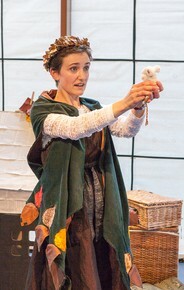 We're delighted to be touring Head in the Clouds with the Puppet Animation Festival this Easter - on the festival website you can see some of the excellent company we'll be keeping. And if you have a look at our dates page and see if we'll be coming to a venue near you! 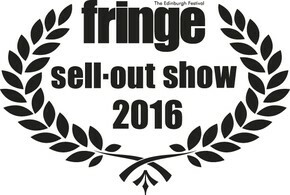 We're very happy to announce that Head in the Clouds has been given Sell-out Laurels from the Edinburgh Festival Fringe this August. A full run of packed out shows officially recognised by the Fringe Society with these majestic leaves. Thank you! Our outdoor performance for babies was first played in Glasgow during the Commonwealth Games and then as part of the 2014 Edinburgh Fringe in the beautiful Botanics. In the summer of 2015 we toured to sunny green spaces around Scotland, occasionally damp muddy ones, and shared a lot of joy. There's more about the piece here.